Just back from Amsterdam and I had a good time! You can fly into Amsterdam with AerLingus from Dublin or Cork, but it was cheaper for me to get a Ryanair flight to and from Dublin than pay the huge price for the Cork flight. I've also restored my loyalty and faith in Ryanair. AerLingus are a bunch of hippies. They can't have it both ways, low fairs and high quality reputation. Has anyone been on an AerLingus flight that was on time? So anyway we stayed in two different Hostels for the week. This was right in the heart of the popular Leidseplein location, great for partying and bars. Be warned tho, to get to our room (which was a box, but did it's job) on the 4th floor, we had to walk up and down 88 steps! Once we got tired of walking up and down those steps we moved to this Hotel, which was closer to central station and a nicer friendlier hotel, not to mention a way nicer breakfast! Nice and quite compared to the last one. There is loads of Museums to keep ya occupied, but be warned about the Van Gogh Museum, he decided to become a painter at the age of 27 and then only did 10 years work before killing himself. Didn't think he deserved a whole Museum dedicated to himself! Also the Museum of Bags and Purses completely fail to mention Scottish sporrans at all! Yet after ordering my meal (of spare ribs with fries and salad) I got charged €17 for the ribs! I questioned it and was told basically since I didn't order it off the special menu, I had to pay the full amount! JERKS! 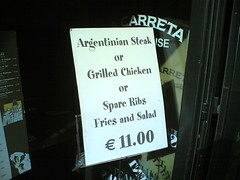 So be warned, avoid Argentinos Restaurant just off Dam Square! So I should put putting up more photos on Flickr, but I have stuff to do now. Off to National Council this weekend I think to decide what kind of Programme we will be offering to our youth members! In just under 2 weeks time it will be decision time for the members of Scouting Ireland. Just 5 years after the vote on the merging of the two associations, we now have to decide on the creation of a new programme for our youth members. This is a very topical subject because with this new programme come lots of other changes like section ages and names. I will point out some of the main issues people seem to have with the new programme. And when I say new programme, it really is the 1st programme ever offered by the new association since its formation. 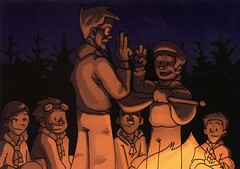 Me on the Cover of the Tracker Scouts Book! The Renewed Approach to Programme (RAP) is a new approach in developing youth programmes, which has been launched in the Interamerican Region some years ago under the name of MacPro and then adopted at world level. It is the approach that National Scout Organisations are advised to use in order to update or improve their youth programme. The development team, along with the handful of brave groups who volunteered to pilot the new programme have spent the last 2 years running, refining and improving all aspects of this new approach to programme. From what I've seen, groups who fully embraced the pilot have flourished and found it beneficial, while some other groups who were more skeptical and didn't implement it correctly seem to have a less positive view of the whole pilot. The bottom line here is that groups have tried this first hand, and the vast majority of them gave it the thumbs up. That is hard fact that is difficult to argue with. Yet people choose to ignore it. By far the biggest issue people have with the new ages for the sections is that they lose 6 year olds. The main reason is that most groups see them as the money making section in the group. So if we were going for money making, why not bring children on board at the young age of 5 like in some countries or even the age of 3 like in India? Think of the money rolling in then! I believe that the programme for Beavers (6 to their 8th birthday) doesn't give the kids a good grounding in the basic scouting experience that they learn as the progress through their scouting lives. It is a baby sitting service, and yes the kids enjoy it and have fun, but from what I've seen, the 7 year olds in the pilot are getting way more out of the section than I've ever seen compared to a Beaver at the same age. Everyone is now a Scout. For the new programme to work I think that there needs to be a new identity, we don't want people falling back into their old way of thinking. These sections are new and nothing like the sections that already exist, and the new names help give a fresh perspective on the sections and a fresh start. Around the world there are many different names for different sections. Even in the UK there are two different scout sections, Scouts and Explorer Scouts. I believe calling all sections Scouts the a great first step, and this is always an evolving process and will be refined as the years go on. As you can probably tell from reading most of that, I'm pretty much in favor on the new programme proposals. 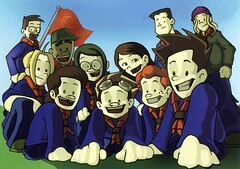 I am a Discovery Scout Leader so I have experienced it first hand. It is no way perfect, nor should it be followed blindly. There are parts we didn't fully implement and parts we changed to suit ourselves. What it has going for it is that it's a start, a step in the right direction and a bold way of thinking that will pay its dividends in years to come. My only fear is that after National Council, and after nearly 4 years in our new association we won't have a proper programme in place for our youth members. Groups will still be stuck in their old way of thinking and Scouting in Ireland won't be able to cater for the changing demands of the young people in society. I do hope at least something gets voted in and that we can all look towards the future with Scouting in Ireland. Afterall, once upon a time we didn't even allow girls in! Got a nice email from Michael from The Langer's Ball (maybe a play on langball?). They are a 2-piece Irish Group that has been performing in and around the Twin Cities in the U.S. I had a quick look at their website and they have The Langer's Blog! No RSS feed tho, so I wouldn't classify it as a real blog. In my eyes a blog has to have a RSS feed! So all this has brought doubt into my mind at the title of my own blog: A Langers Blog. Should there be an apostrophe in my title?! I wondered about this before, but just decided to leave it out. So should I have one?